A very happy new year to our Seidenberg community, and we hope your break was restful and warm. 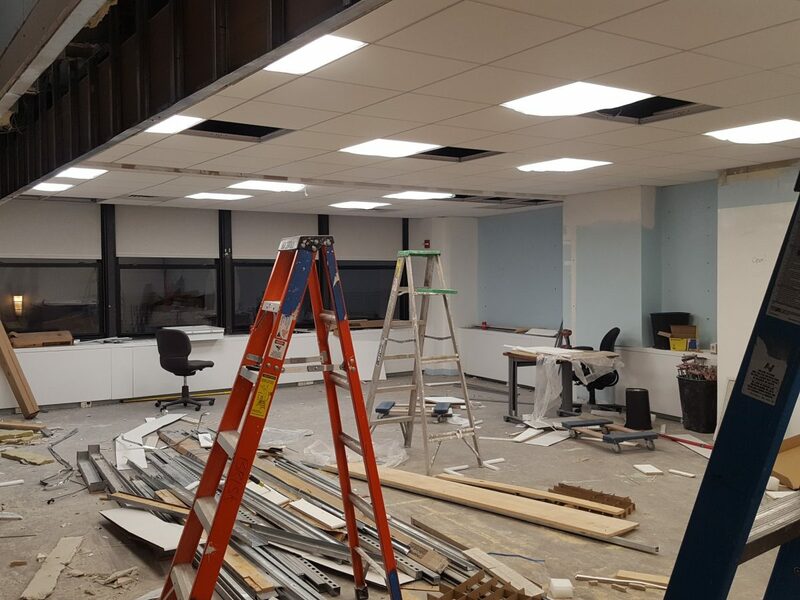 This year, there was no rest for the Seidenberg School – throughout the holidays, construction crews have been working on both our New York City and Pleasantville campus locations, tearing Seidenberg School apart to make way for exciting new spaces. Walls have come down, and fewer walls have gone back up. We have built new spaces for our students, faculty, and staff to work, collaborate, and relax in. There is a really, really big TV in Pleasantville that can be used for video conferencing and presentations (and Netflix?) – and that’s just the beginning. Thanks to a generous support from Pace University, we have been able to take major steps toward becoming the school of computing and technology we have always dreamed of being. 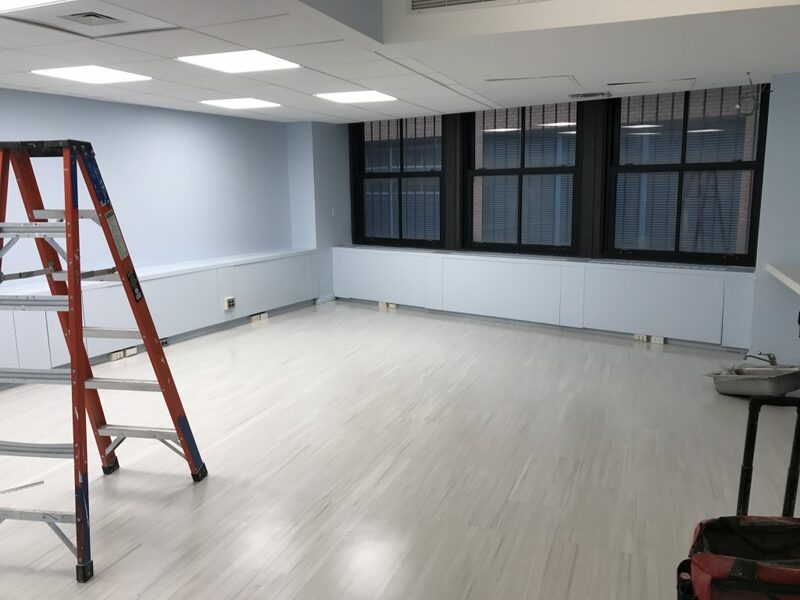 Our space in New York City is becoming a STEM haven, with a spacious new collaboration area opening up where the second floor conference room and adjoining lab space was. The conference room has been moved to the opposite corner of the floor, stealing Dean Jonathan Hill and Assistant Dean Stephanie Elson’s offices (oh no! ), for a spot which is not only easier to find but will allow bright and spacious video conference work. The aforementioned collaboration space is a Design Factory must, and the project has included building a new area where groups can come together and use design thinking techniques to ideate, design, and build real world products with international students who visit us through our Product Development Project (PDP) and Product Innovation Project (PIP) programs. The classroom in room 237 is also undergoing a major development. The entire wall adjoining the main floor will be replaced with writable glass for classwork and projects. Even the kitchen is getting a makeover! Seidenberg School is not just changing: it’s expanding, too. On the year of the school’s 35th birthday, we have moved out of the proverbial basement and onto the first floor… well, third. While the School is still based on the second floor at 163 William Street, rooms on the third floor have been allocated to fulfil our urgent need for space. We have more students than ever, and the extra room will help greatly with accommodating their needs for work and research space. On the third floor, the Applied Data and Networking Sciences Lab (also known as the Innovation Lab) is moving into what was previously a call center. The room is a huge space where the lab, run by Dr. Jim Gabberty, can continue to flourish. Providing hands-on experience with cybersecurity techniques, big data analysis, and networking using Cisco tools, the lab has already helped a sizeable number of students get excellent jobs since it opened at the tail end of 2016. The displaced Dean Hill and Stephanie Elson can also be found on the third floor, in new offices built where our Mac Lab used to be. The tenth floor isn’t being abandoned, though – the Computer Forensics lab directed by Dr. Darren Hayes will be moved up into one of the light and bright rooms to allow students to crack codes in a far more pleasant surrounding. In Pleasantville, it’s not just about the new TV. 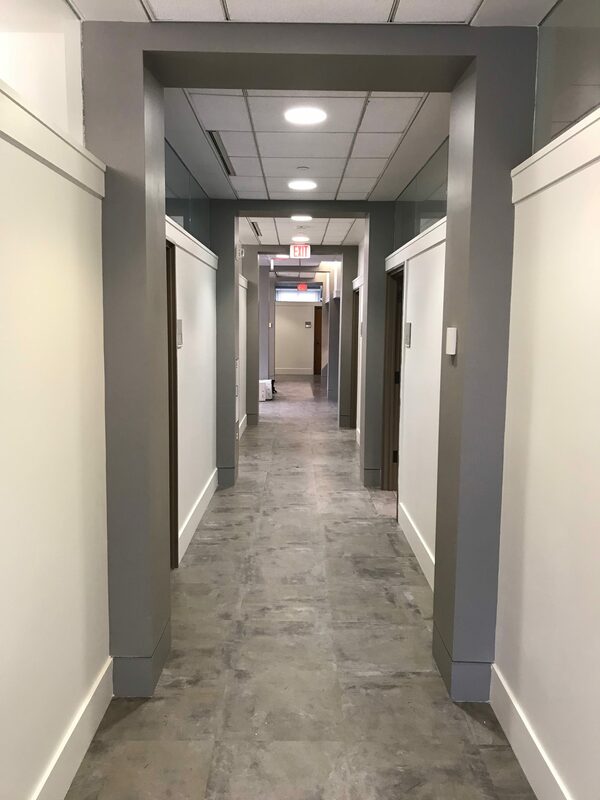 The third floor at Goldstein Academic Center has been refloored, painted, and undergone a chunk of construction itself. 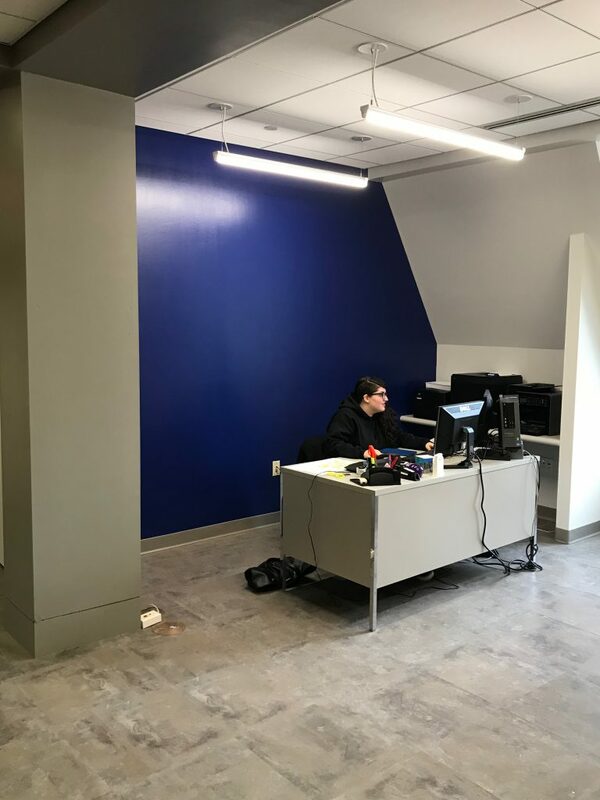 New space has been created at the front desk reception area via the removal of the wall-to-wall filing cabinets and new furniture is set to arrive soon to create a much more attractive welcome area for our students and guests. Best of all is the brand new student lounge at the back of the floor. 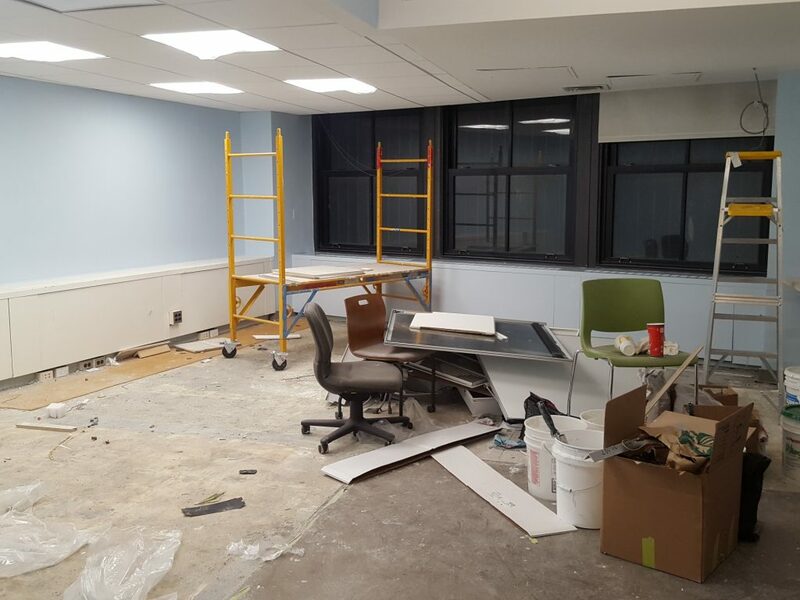 The classroom in room G321 has been torn down to make way for a spacious hangout spot for our students – and all Pace students – to relax, do homework, collaborate, and spend time at Seidenberg. Thanks to funds kindly allocated by Pace University, we have been able to build the kind of student lounge at the Pleasantville campus we have always wanted to offer our students – so once it’s finished, make the most of it! And yes, it does happen to be the same spot as the (now famous) television. 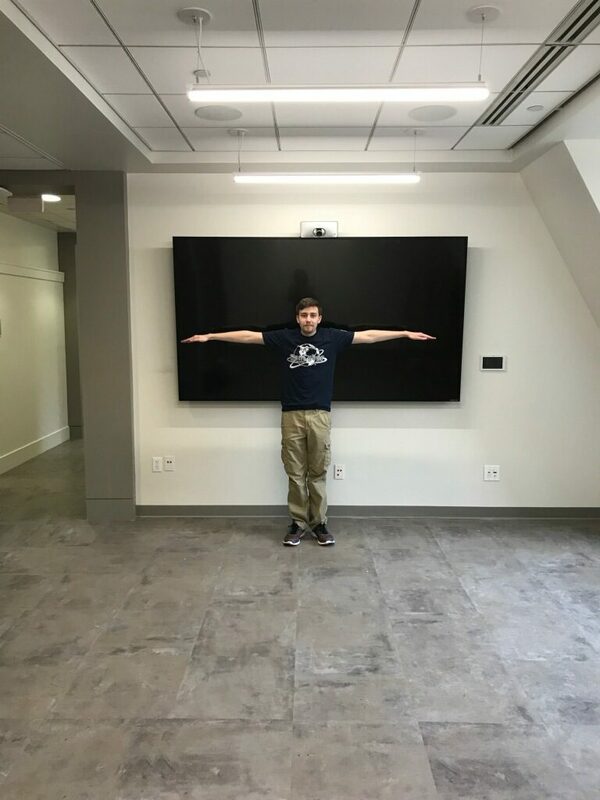 Our new touch TV, with added Tristan for scale! The updates at Pleasantville are stage one of our renovation process. Over summer 2018, more construction is planned to upgrade the two laboratories in Goldstein 300 and 315, so stay tuned! That just about wraps up the physical changes for now, but there are many more changes happening at Seidenberg beyond the way we look. Our department chairs are hard at work with the faculty updating our program curricula to ensure our bachelor’s and master’s degrees offer students great value. Speaking of faculty, we are in the process of hiring new faculty who will help us achieve our mission of providing an excellent academic experience alongside co-curricular opportunities you will find nowhere else. We are extremely excited about growing our team of dedicated professors and expanding our artificial intelligence, data analytics, user experience (UX), and cybersecurity. We’re very much looking forward to welcoming our incoming students this Spring and growing together as a School, as a University, and as a community. Looks much more modern. It’s been 10 years I need to come back and visit!